For girls only, Junona showcase a selection of stunning occasion wear pieces made in the finest quality fabrics. The collection includes beautifully made dresses, jackets, matching accessories and more. Exclusive to Childrensalon, this exquisite dress by Junona is sure to turn heads. 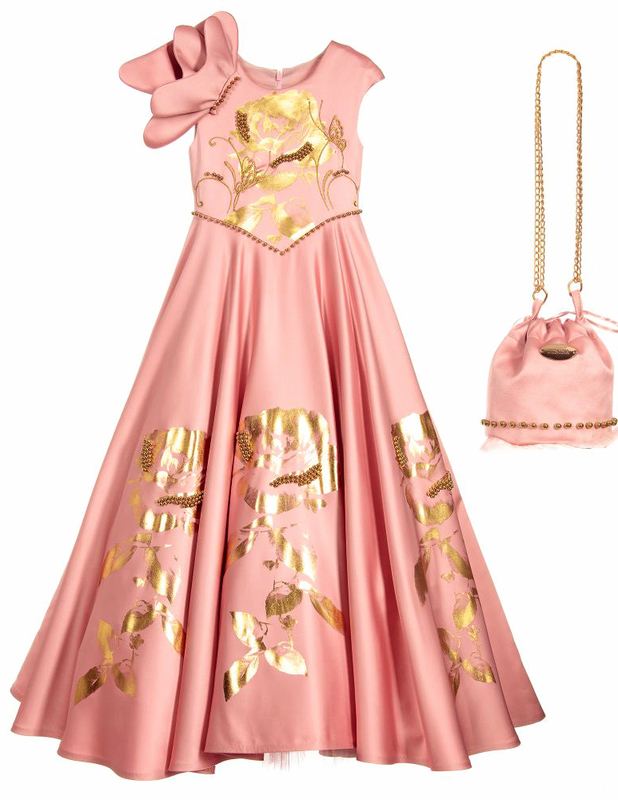 Made in pink satin with gold floral print, embroidery and beading, it has petticoats made with tiers of tulle to create an elegant and timeless silhouette. This yellow occasion dress by Junona has a stunning floral print and matching bow hairband. It has a layer of tulle on the lining for volume, and comes with an adjustable, golden belt for a luxury finish. This incredible dress by Junona is handmade in sumptuous off-white satin, printed with blush pink roses. Exclusive to Childrensalon, it is embellished with pearl beads, embroidered butterfly appliqués and is longer at the back than the front. With layers of tulle for fabulous volume, it will make every girl feel like a princess and includes a white satin drawstring bag with a gold chain.